Power management integrated circuit (PMIC) market surpassed value worth US$ 20.9 billion in 2018, as per a new Future Market Insight study. 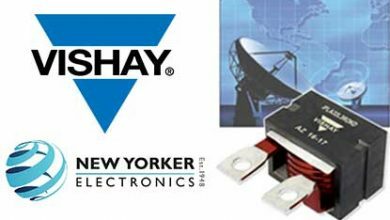 The study unveiled that demand for power management integrated circuit (PMIC) in communication equipment application is projected to grow at a higher rate. In 2019, PMIC application in communication equipment is expected to grow at 8.5% y-o-y. 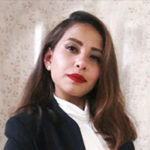 The projected growth can be attributed to buoyancy in the telecommunication industry owing to increasing demand for connectivity and adoption of communication equipment starting from analogue switches to smartphones to communication satellites. The FMI study also reveals that demand for power management integrated circuit (PMIC) remains higher in personal electronics devices. In 2018, sales of power management integrated circuit garnered revenues worth over US$ 5.7 billion in 2018 and held 27% of the global PMIC market share. The demand trend in personal electronics application is expected to continue in 2019 at the rate of 6.6% y-o-y. A plethora of personal electronics devices and their rising adoption rate in the wake of increasing millennial population, expansion of middle class and increased purchase capacity are factors responsible for the increasing demand for power management integrated circuit (PMIC) in personal electronics application. 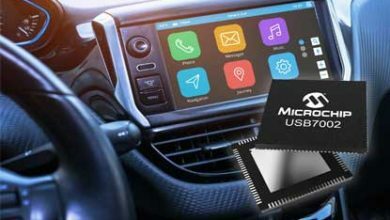 In addition, manufacturers in the consumer electronics industry highly utilize PMIC to optimize energy consumption in compact devices. Industrial application of power management integrated circuit (PMIC) registered second highest revenues and accounted for over one-fifth of the market revenues in 2018. 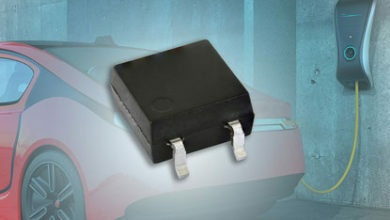 Demand for power management integrated circuit (PMIC) in an automotive sector closely follows revenues in industrial application. Leading players in the power management integrated circuit (PMIC) marketplace share considerable revenues. Among which, ON Semiconductor is the front runner. Small and mid-sized players are leveraging strategies such as the introduction of low-priced products to establish a stronghold in the domestic market. Increasing revenues of these players are eating into the shares of prominent PMIC market players. 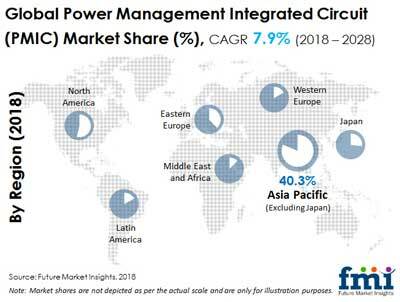 The FMI study finds that APEJ continues to register leading position in the power management integrated circuit (PMIC) market. In 2018, over two-fifth of the PMIC market revenues were accounted for APEJ region, of which over 67% share was registered from China and India. The region presents significant growth of the end-user industries of the power management integrated circuit (PMIC) market, thereby garnering leading revenues. The FMI study finds that North America continues to register the second leading position in the power management integrated circuit (PMIC) market. In 2018, over one-fourth of the PMIC market revenues were accounted for the North America region, of which over 81% share was registered from the U.S.
Across the globe, increasing energy harvesting initiatives and their penetration in the semiconductor industry has generated lucrative opportunities for power management integrated circuit (PMIC) market. 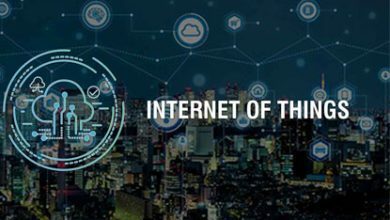 As the global demand for electricity rises and the world enters the era of IoT and digitalization, demand for power management integrated circuit (PMIC) is set to rise in the coming years. The FMI report tracks the power management integrated circuit (PMIC) market for the period 2018-2028. According to the report, the power management integrated circuit (PMIC) market is projected to grow at 7.9% CAGR through 2028.